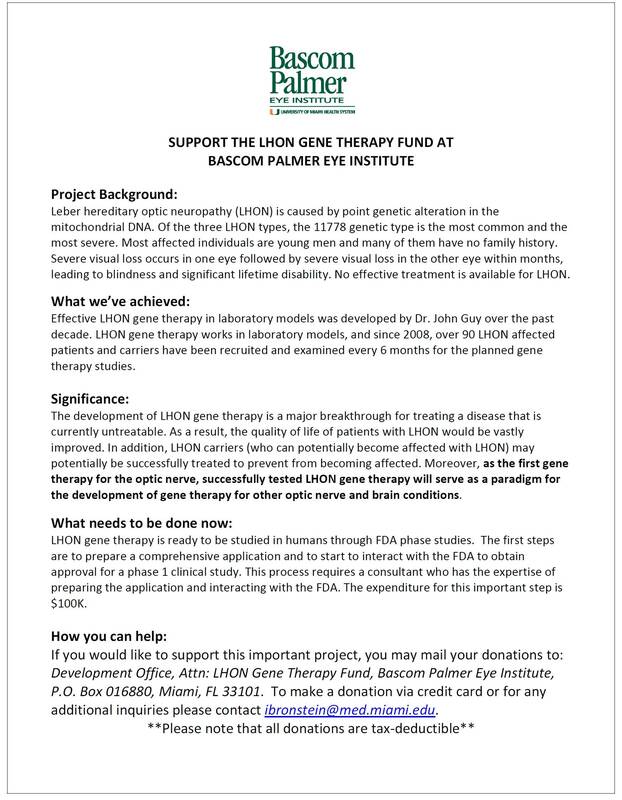 HEY EVERYONE, WE NEED HELP RAISING MONEY TO KEEP THE STUDY IN MIAMI GOING SO WE CAN KEEP THIS CURE FOR LHON 11778a MOVING FORWARD! THE LETTER BELOW WILL GIVE YOU MORE INFO AND THE LINK BELOW WILL TAKE YOU TO A UNIVERSITY OF MIAMI WEBSITE TO DONATE!!! PLEASE HELP US GET OUR VISION BACK! 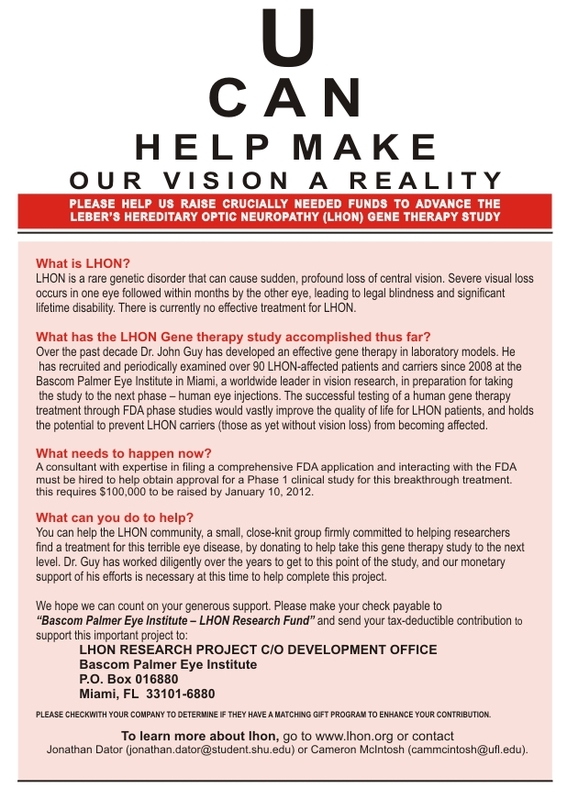 This entry was posted in Bascom Palmer Eye Institute, Blindness, Fundraising, G11778A, Gene Therapy, genetic disease, leber's, Lebers Hereditary Optic Neuropathy, LHON Cure, Mitochondria Diseasse on December 9, 2011 by Christy Aston. This is Christy Aston, Brian’s Mom. I am sorry to hear about your son. Idebenone is a natural supplement that you can purchase at http://www.smartpowders.com Brian was blind for over 7 years before beginning Idebenone and has had great results from the Idebenone and Purity Product Vitamins. He is so committed to healing himself from the inside out. He has regained some vision and it has certainly made life better for him. He really gave up for many years and it was very difficult as a Mom to feel so helpless. Get into the Gene Therapy Study in Miami if you can, the research on this disease is amazing. 8 years ago there was nothing out there, no research, no information. We held a fundraiser last year to get Brian from Seattle to Miami and to order all the Idebenone and Vitamins. He also set up a FundRazer Acct on Facebook for people who couldn’t attend the fundraiser. We are gearing up for another one in April. I started a Moms of LHON page today as I feel our stories are so different than our son’s & daughters, we need a place also to tell our stories too. Feel free to stay in contact. I will have Brian make me a list of his vitamins and send you. He is now working (first time in 8 years) so he doesn’t have a lot of extra time.